Maryland is tied for third place with Connecticut as one of the top wealthiest states, but continues to rank as the state with the highest household incomes, according to a new rankings produced by WalletHub. Just last month, 24/7Wall St., a financial news web site, called Maryland “the wealthiest state in the nation,” based on those high incomes. According to a different study, for a third year in the row, Maryland has the highest percentage of millionaires — people with over $1 million in investable assets, not people who make that much money each year. WalletHub, an online resource known for its rating tools, used data from the Internal Revenue Service, the Census Bureau and the Bureau of Economic analysis to base it rankings on income, Gross Domestic Product per capita, and amount of federal taxes paid per capita. Maryland came in first among the states based on the percentage of households with high incomes. It ranked 6th based on GDP per capita but only 14th in amount of federal taxes paid per capita. The rankings did not take into account state and local taxes, but all the “rich” states also have high state and local taxes. Tops were D.C. and New Jersey, tied for 1st place; Maryland and Connecticut tied for 3rd; and Massachusetts was 5th with Delaware and Virginia at 8th and 9th. Maryland is often cited as the state with the highest median income ($72,483), which led 24/7 Wall Street to call Maryland “the wealthiest state in the U.S. again last year.” Both WalletHub and 24/7Wall St. refer to Maryland’s low percentage of people in poverty –just over 10% — and high percentage of households making over $200,000 — almost 9%. For the past eight years, Phoenix Marketing International, a global marketing firm that studies the world’s wealthiest people, has ranked states based on a percentage of households with $1 million or more in liquid assets. The firm does not count real estate and pension benefits that can’t be touched, but it does count 401(k) and other retirement assets that can be invested at the direction of the owner. Maryland took over top place among millionaires in 2011 from Hawaii, and the percentage of households with over $1 million in assets has each year to 7.7% of Maryland’s 2.2 million households last year. New Jersey and Connecticut rank 2nd and 3rd, Virginia ranks 7th, and Delaware and D.C. rank 9th and 10th respectively in number of millionaires. 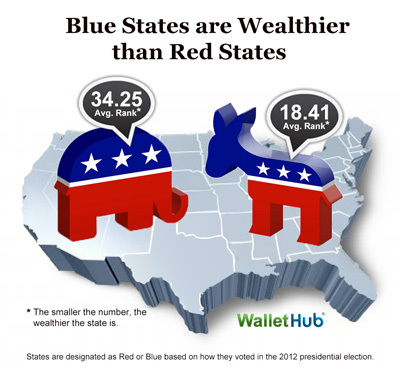 WalletHub also said the blue (Democratic) states are wealthier than the red (Republican) states. Maryland’s counties of the Eastern Shore and Western Maryland have lower per capita incomes than the central part of the state, and also vote Republican.